If you’ve been on a cruise, you’ve probably been to Nassau. The closest international city to the United States that doesn’t share a national border has been a popular cruise stop since the advent of the lido deck. Naturally, the time-honored things to do in Nassau -- the straw market, Señor Frog's, duty-free shops -- have become as much a part of cruising as the midnight buffet. But as cruising has grown up, so has Nassau. And there are now far more things to do in Nassau than perusing three-for-$10 T-shirts. 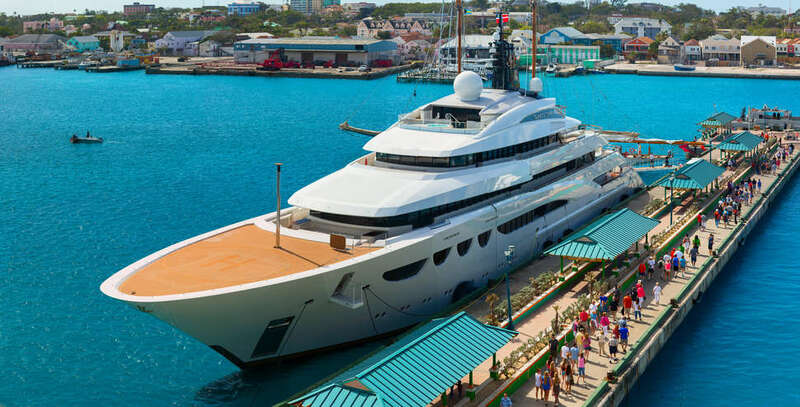 As more competition for port calls has led Nassau to find more things to do, the experience here has evolved. If you haven’t been in a while -- or you find yourself weighing your first cruise to the Bahamas -- have a look through the 20 best things to do in Nassau. The first zoo in the Bahamas is a lush tropical garden with more than 200 tropical animals, including the Caribbean flamingo, bred there since the 1950s. 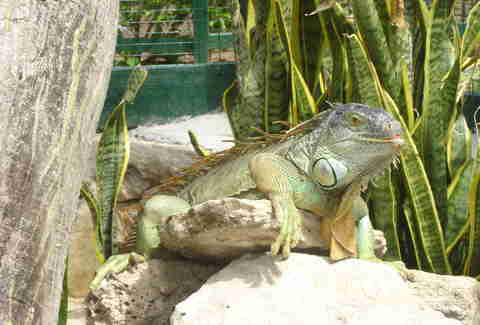 It’s also home to parrots, lemurs, domestic pigs, and all varieties of tropical plants. Arawak Cay is probably the only place in Nassau where you’ll find locals in as great of abundance as tourists. This spot on West Bay Street is chock-full of authentic Bahamian restaurants, most notably Twin Brothers and Goldie’s, with its famous cracked conch. Locals just call it the “fish fry,” presumably named after the seafood meals, but possibly for some other, more-hidden connotation. If you’ve got the certification, a day in Nassau is the perfect opportunity to cross shark diving of your scuba wish list. This three-and-a-half-hour, two-tank dive takes you to the renowned Shark Wall, where you’ll swim with Caribbean reef sharks throughout your dive. The second trip down has your guide feeding sharks at the end of a pole, an experience hard to come by outside the confines of television. The Bahamas’ best collection of history, education, and gorgeous scenery resides at this park at the far west end of New Providence. The landscape here ranges from white sand beaches to wetlands to rocks and sand dunes, but the most fascinating parts are the replica buildings from the Lucayan people, the islands’ original inhabitants, and the remnants of old plantations in the days of the Bahamian slave trade. 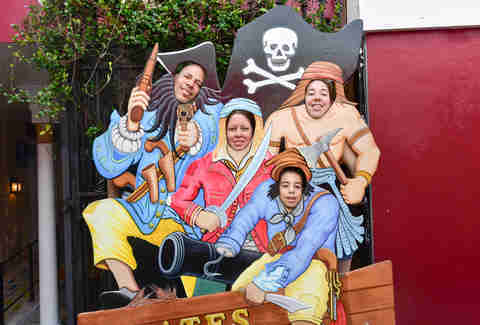 In probably the world’s coolest pirate attraction that doesn’t include a catchy theme song, this museum is all set in a replica pirate ship, complete with hammocks, a cannon, and live-action pirates. It’s a little like Colonial Williamsburg meets Gasparilla, and just as fun for adults as it is for kids. 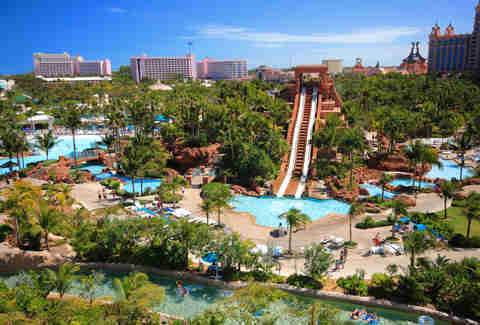 The water park at Atlantis Paradise Island isn’t the jackknife-and-corkscrew park you grew up going to. This one is a 141-acre behemoth with a floating river that boasts rapids and intense waves, as well as 11 swimming pools and a slide down the front of a Mayan temple. It’s nearly a full hour’s boat ride from Nassau to Exuma, which might seem like a long way to go see a bunch of pigs. But the legendary swimming pigs of Exuma are really just the snorting exclamation point to a boat ride over crystal-clear water and an afternoon on one of the most beautiful beaches in the world. Stingrays get a bad rap. The ones with barbed tails can be brutal, but the ones that populate Stingray City Park just off Nassau are gentle, playful Southern Rays. These big, slimy pizza boxes will swim right up to you and ask for a kiss on the head, so go ahead and give them one. It’s possibly your best photo-op in Nassau. 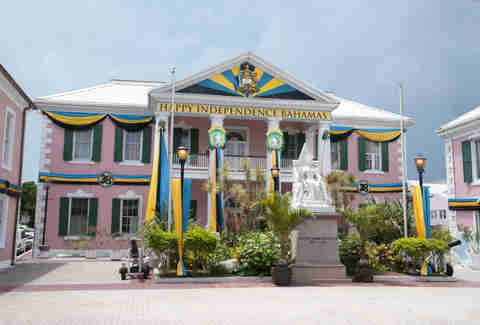 As the name might suggest, the brightly colored colonial buildings near the straw market are the hub of the Bahamian government. Simply touring the historic buildings that date back to 1815 is a fascinating look at how the nation operates. If the National Assembly is in session you’re free to wander in and see laws get made. No Caribbean island jaunt is complete without a ramble through a historic fort, and Nassau’s best is Fort Charlotte. Constructed in 1788, it offers a sprawling 100 acres of cannons, dungeons, and even secret passages and tunnels for you to explore. Get your marine life fix in bulk at the cavernous marine habitat at Atlantis Paradise Island. More than 250 marine species fill 8 million gallons of ocean water in 14 lagoons, where visitors can hang out with sea lions, pet stingrays, or ride a waterslide through a shark habitat. Though you need a permit to dive one of the biggest underwater cave systems in the world, the walks over and around them are one of the most distinct experiences you can have in Nassau. If the caves don’t stoke your fire, the park is also home to one of the most secluded beaches in the area at Gold Rock Beach, with some first-rate shelling along the white sand. OK, so the famous pirate actually has nothing to do with the rum that’s made at the historic Buena Vista estate, other than his name being on the label. But that doesn’t make a trip here any less enjoyable. Here you’ll tour the estate, see how the goods are made, and sample some of their best stuff in the Red Turtle Tavern. These steps constructed in the late 18th century were once the main route from Fort Fincastle into the city of Nassau. 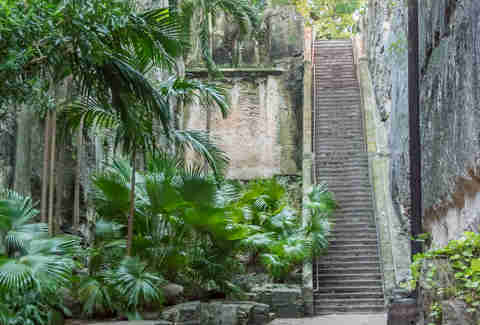 Now “the 66 steps” stand surrounded by moss, ferns, and vines, and look almost like Mayan ruins set on a marshy Caribbean island. The walk won’t take long, and the steps are a cool, shady respite on a hot day. Though we’ve pointed out some historic highlights, the forts and houses worth seeing on the island aren’t limited to what we’ve mentioned. Spending the afternoon on an historic tour will take you to stops like Fort Montagu -- a limestone fort right on the water -- and the Graycliff Hotel, home to the best chocolatier on the island. 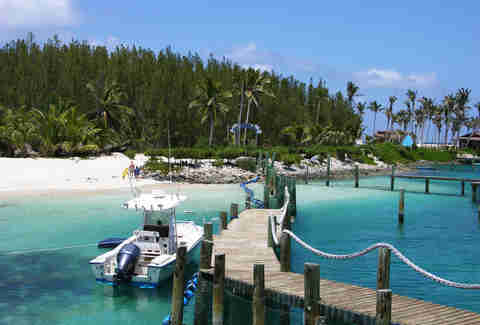 This private island a few miles from Nassau is a sort of eco theme park, where powdery beaches and turquoise waters are the natural habitat of dolphins and sea lions. Though it’s a popular attraction, the beach still feels more remote and natural than the ones in Nassau. 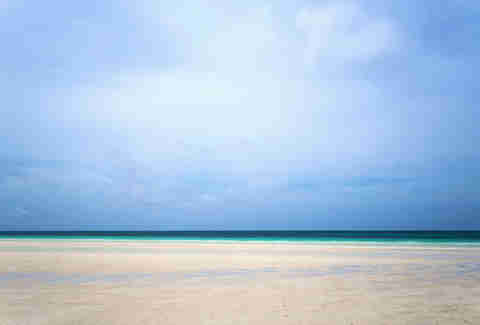 If relaxing on the beach was tops on your Bahamian agenda, this is the place to do it. If you’ve got kids with you, or just missed out on swimming with dolphins when you were a kid, you’re practically obligated to have a dolphin encounter at Blue Lagoon. After a short orientation, visitors get to splash around with the playful mammals for half an hour, culminating in a “foot push” -- best described as dolphin waterskiing. You’d probably have to be some kind of Bond film savant to know the Tears of Allah was a freighter used to transport nuclear weapons in Never Say Never Again. Or recognize the underwater bomber where Sean Connery escaped a tiger shark in Thunderball. But you can see them both from 80 feet above as you snorkel through the waters of Atlantis, or scope ‘em close up from the Atlantis Submarine. The long-awaited Chinese-backed resort district of Baha Mar finally opened its doors this year. The first hotel to open is the Grand Hyatt, which features cliff jumps, swim-up aquariums, and an underwater cavern modeled after Dean’s Blue Hole. It’s also got its own outpost of the trendy sushi spot Katsuya. And sometimes, well, you just wanna drink. The best place to do it is at the Daiquiri Shack, where each drink is made from fresh local fruit and Bahamian rum, and will only run you about $6. Not only is it one of the cheaper drinks you’ll find in Nassau, but also the best.